Moderately difficult high altitude trek into pristine, unspoiled area. 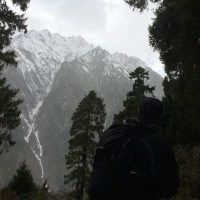 Undoubtedly, trekking in Bhutan is all together a different experience – pristine environs, surreal landscapes, distinct social & cultural parameter of Yak herders tribes, alpine lakes etc. And if the trail happen to be less frequented by travellers by any standard, wholeheartedly, adds a charm and affluence of its own. To conjure up a name for such kind of existing trail – Masagang Trek immediately rings the bells. 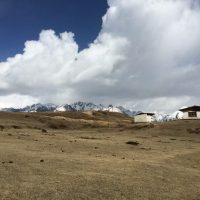 This itinerary takes a detour to Laya village, exposing unique social and cultural characters, adding a depth to this trek with social dimension through interaction with Layap. Crossing some Army checkpoint that only reiterate its closeness to Tibet. And some scattered yet tranquil houses and Yak Herder makeshift or dilapidated huts all along the way. Finally opening up to the grandeur of Masagang and other peaks. For locals it has invariably draws a sense of reverence and sacredness ingrained in its history and belief. And for others, a sense of awe in nature, spirit and character based on its sheer beauty and magnitude. 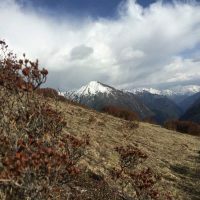 The trail is as old as time, largely without any footprint of visitors other than Yak Herders and a few locals. The trail treaded upon by local only, conserving its originality. Its nascent form, breathtaking landscape, local people etc in combination makes it one of the truly remarkable trek in Bhutan. Meet driver and guide and transfer to hotel. Later visit Rinchenpung Dzong and National Museum. If time permits visit nearby agarian village. Overnight in Hotel. Drive to capital Thimphu for brief stop in case you need to pick up anything (1hr). Drive up to Dochula pass (40 min) and hike to Lungchutse Monastery (3hrs) round trip to provide some aclimitisation for your trek. Then drive to Punakha valley and visit local attractions such as Punakha Dzong. Spend the full day in Punakha valley, taking in multiple short walks to get used to hiking. 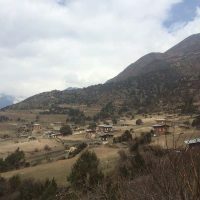 This will include hike to Khamsum Chorten, and walk from Nobgang village, while enjoying the great view of the valley with terraced paddies fields. Early start for an drive upto Gasa Dzong, which takes about 3-4hrs. We continue further along the new road cutting and go as far as it is possible, starting our trek somewhere near Chamsa or Koiena (3250m). Meet the horseman and the crew and after quickly handing over your luggage, begin 2-3hr trek to the campsite near the riverbank (3400m). Following the Mo chhu river upstream, the trail gradually mount, after 2 -3 hours of trek arrive at military check point at Takse Marka (3480 m). From here on, topography changes, leaving the Mo chu river Bank, trek get steep to climb Laya plateau with flourishing alpine vegetation. Laya has distinct social landscape and economy predominantly cattle rearing and herding. Women stands out with typical attire of small pointed conical hat (Bamboo) and broad spectrum of colourful jewelries. Laya village consist of handful of households with a school, monastery and beautiful natural landscape. What makes exploration of village a special affair are the people or locally called “Layap” is there ever friendly disposition and willingness to strike a conversation with guest. Get insights into their daily life, visit village monastery and school if open. Modern means have made inroads such as electricity & mobile towers in Laya & next Lungo village however strong sense of culture, social and religious values are still evident. Post breakfast, embark on day’s trek, initially trail climbs till the ridge and follows the ridge for a while until the meadows. 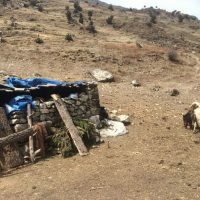 After, descend through good forest trail arriving in ramshackle stone house of Laya’s Yak herder. From here, it offers first sight of Lungo village in a distance. Further descend to valley bottom and cross Zamdo chhu river (3580 m) and climb for 2 hours to reach Lungo village. Replenish energy levels with rest, beautiful landscape of Lungo village, Tea and snack. 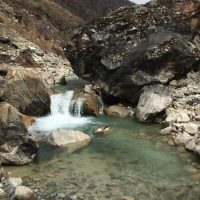 Subsequently, trek to reach campsite at Tashi Markar is 3 hours almost but the trail gradation is relatively easy as it runs on flat trail parallel to Zamdo river upstream. Along the course of this trail, Mt Tsengda Kanga on right & Mt Masagang on left open ups beautifully. In term of distance to cover, today is relatively short, Begin hike a little further into the valley to reach the foot of the Masagang (7.194 m). A waterfall covers the steep stone walls and fills the air with the roar of thunder. The high meadows we pass through are very dry and serve the yak shepherds from Laya as winter pastures. Camp Nulithang (4.050 m) is opposite the Masagang, 10 min after crossing the Nung Chi Tang River. We walk a bit longer along the river to another campsite, located next to a small stream and that offers a better protection from the wind. 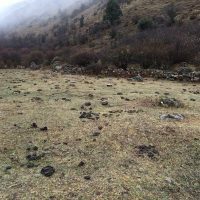 Yaks graze on the slopes, and every now and then a shepherd camp lies on the way. For today, there are couple of excursion on offers. And in all cases its amidst breathtaking mountain vista. Firstly, climb to “Chethola view point ” (5010 m) it accesses uninterrupted view of Mt Masagang. It appears so close that it gives an impression that one can touch it by merely stretching his hand. Note, the trail is steep and not proper and follow the same way down. It takes around 4 hours for round trip. Secondly, its relatively less demanding to climb other hills. 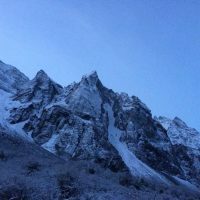 Starting from above Somji, ascend a hill ridge and as we follow the trail Mt Masagang gradually open to our view, further hike of 2 hours lead to Yak herder Camp and from here it displays exotic view of Mt Masagang, Tsenda Khang, Kang Bum and other peaks. Finally, hike north to Phongme, following river upstream taking right bank and left on the way back. Its a long hike of 8 hours for round trip but one can choose to hike till dilapidated monastery which lies roughly half way. Today is relatively easy day hike in term of gradation without any noticeable switch backs. Before leaving, you may visit beautiful alpine dale for last time. Perhaps, taking a hour walk in vicinity. After, descend leaving behind the great stunning Himalayan mountain descending to Takse marka. We can see the trail where it leads to lungo village to the right side. Camping in beautiful Takse Markar however as it lies shadow side of mountain, brace for the cold night. Today we must start early as we have to walk in a muddy path by Koiena to meet the vehicle and drive to Gasa Dzong and further down to Gasa hot spring. The hot spring are on the bank of the stream near the campsite. There are several pool with various water temperature, ranging from warm to scalding water temperature. Allegedly, it is believed that hot spring water has therapeutic benefits. Drive through the farm road till Punkaha and over the paved road continue drive to Thimphu. However stop at Docula pass to stretch your leg and also to savour the vista of mountains peaks. Later in Thimphu visit centennial farmer market that stay abuzzed with supplier and people who comes for fresh supply of household items. Walk into pavilon of Changlimithang National ground to watch archery in action. Overnight in Hotel. Thimphu is the capital and like any capital, it has some fascinating attractions in its fold. However there will be mix of some prominent attractions and short walks. Visit cultural attraction like Giant Buddha Statue, Tashichho Dzong, School of handicraft and museum, institute of traditional medicine etc and also short walk in between and to visit cherry monastery in north of town. Overnight in Hotel. 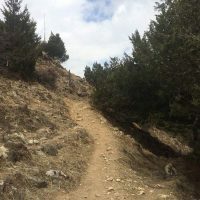 Today is iconic Takstang monastery hike. 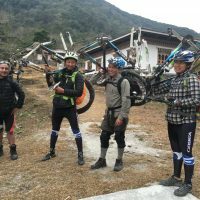 It takes around 1 hour and half to Takstang Moanstery’s trail head from Thimphu. It takes around 2 hours or less to reach 1st view point. Further climb of 45 mins to 1 hours takes to famed Takhtsang Monastery or Tiger’s Nest Monastery. It takes almost half of time on the way down. Free evening, you may choose to visit small yet attractive Paro town. Farewell dinner. Overnight in Hotel. Trip SeasonsSpring(March - May) & Falls (Sept - Nov) are best seasons. Starting from USD$ 2750 per person (Land), based on group size, travel date, hotels. Please ask for details. Bhutan Royalties, tourists fees, Visa fees and taxes. 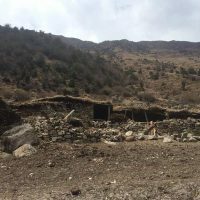 Accommodations in listed or similar hotels (pleasant hotels 3-4 star type) during the tour and in tents during the trek. All meals, including evening tea/coffee etc through-out the trip. 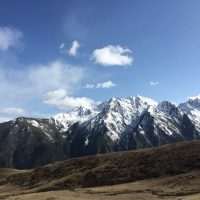 Provided during the trek: tents (sleeping, dining Kitchen and toilet tents), trekking mattresses, small air pillow, Hot-water bag, Pressured Altitude Bag for altitude emergencies, Pack animals to carry luggage and additional riding pony for emergency. Basic Medical Kit. Trekking Guide, Cook and assistants accompany the group. All meals, beverages and snacks are provided. Sleeping bag is available for nominal cleaning charges. 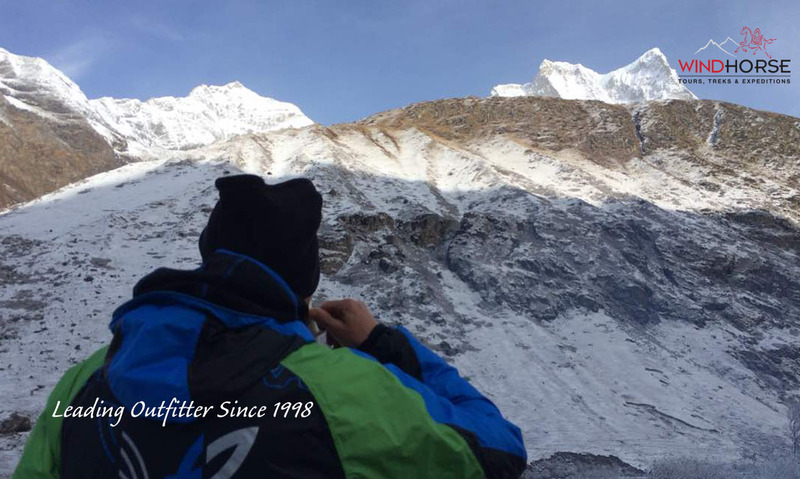 We are constantly upgrading our trekking equipment and gears, so you can be assured that you will receive the best and latest. We use the best sleeping tents (Mountain Hard Wear Trango). Flights in and out of Bhutan. Personal trekking gears such as sleeping bag, clothing, shoes etc. Sleeping bags are available for small cleaning fee. Yonten Phuntsho may give way to being shy guy bordering with man of a few words. But he is man who loves to be in thick of action . He leads from the front whilst on the tour. Behind his facade lies the guide whose knowledge and passion runs deep for the love of his works. His aptly quote Barbara Kingsolver “I do my best work if I think about what it is I have to offer”. From the outset, he knew what he wants to do in his life. Right after finishing his Class 12, he enrolled for guide course for culture initially then extended few more month to complete course on Trekking as well in 2008. After doing free lancing for a while, he joined Wind Horse Tours in 2010. For most Bhutanese, appeals that mountainous terrains throw in for an out door adventures are native. In the case of Yonten, it was no exception. He easily gave in to the temptation of Mountain biking with its advent. 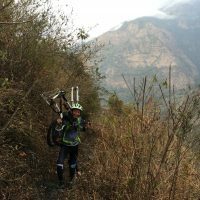 He explored and lead tours in his bike but his allegiance is more inclined to off road biking trips that leads to quaint villages. 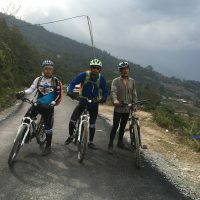 To explore the unknown and love for nature, these attributes that he cultivated while trekking the alpine highlands and wilderness in remote corner of country was what prompt him to readily agree to embark on audacious Haa to Phuentsholing on mountain bike, overcoming challenges of carrying bike in tough terrains, untamed vegetations and unexplored areas. From the outset, Pema Namgyal knew what he wanted to do in life. He love to keep things simple. 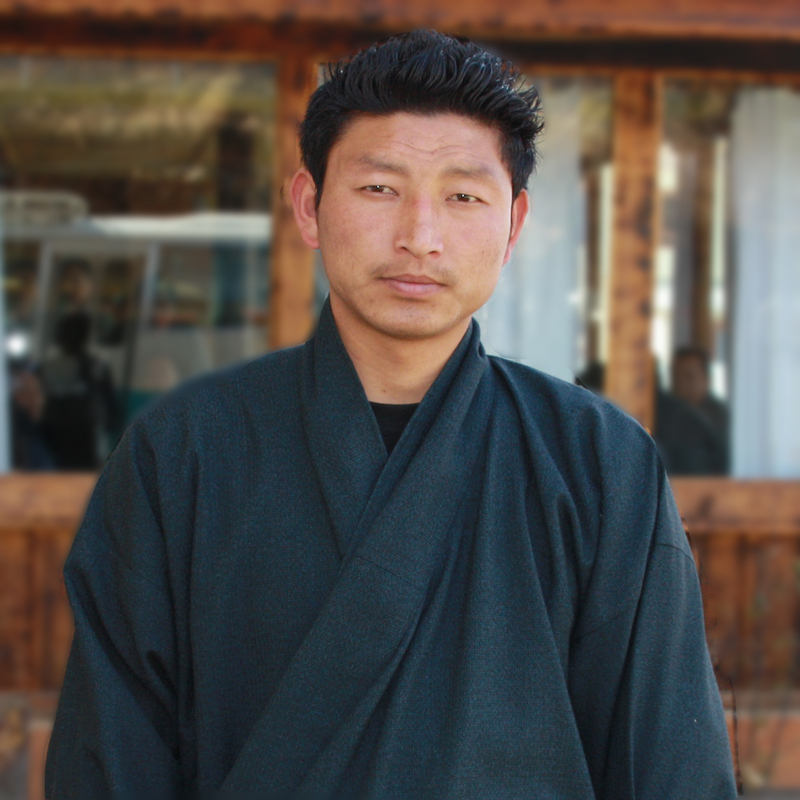 Right after finishing his Class 12 from school in Thimphu in 2004, he joined guiding course to aspire to be a guide. 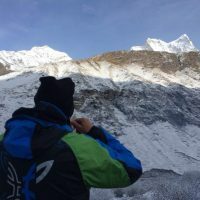 Initially he started as cultural guide but with time, he felt more connected with wilderness, he did course for trek in 2008. 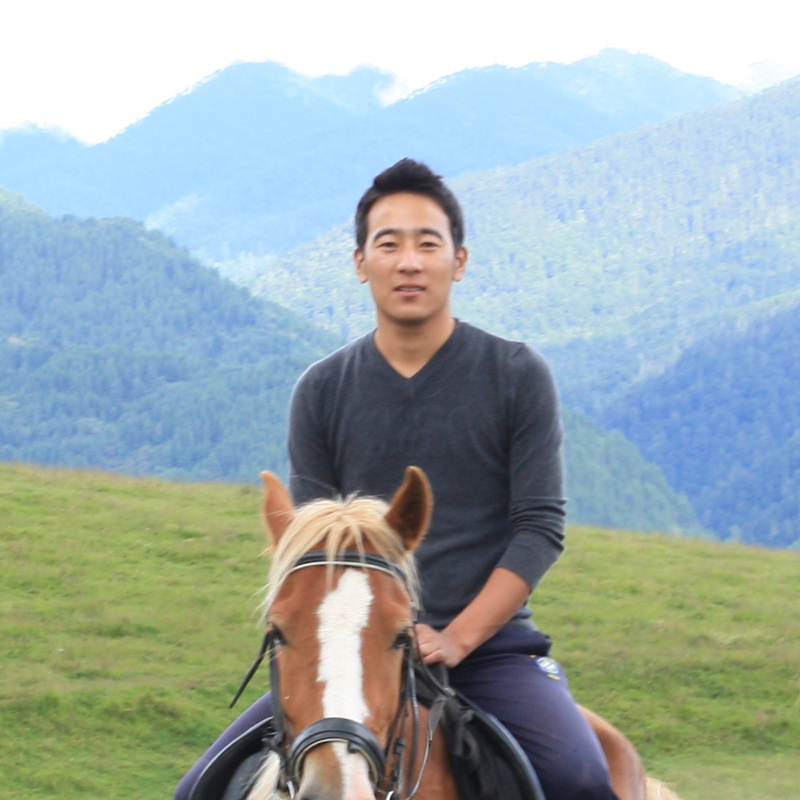 After a fruitful experiences with other companies, he joined Wind Horse Tours in 2010. He has led many treks, and I seriously doubt, if there are any tourist trails that he hasn’t tread upon. 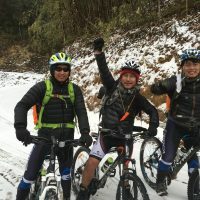 One trek that stand out is challenging Snowman Trek, he comes highly recommended for this. 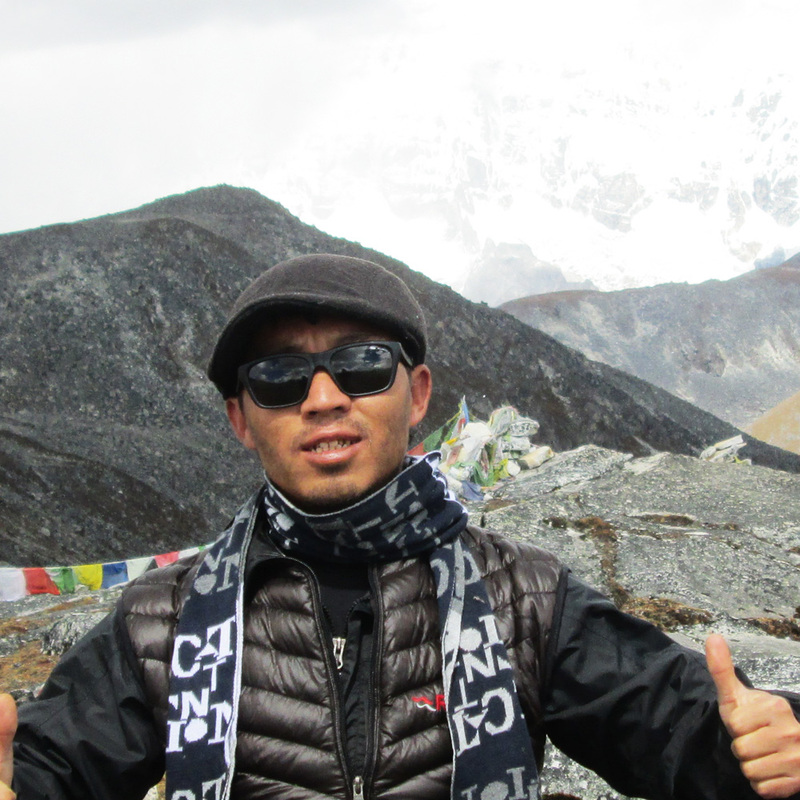 In October, 2014 he successfully completed Snowman trek with 4 guests. Growth in Tourism in Bhutan has also its share of impact on young minds. With tourists freely moving around, the curiosities to know them, talk to them holds ground firmly on young minds . Namgay is one among many youth whose imagination was captured by razzmatazz of tourism. He has his career goal cut out, he could have easily opted for some comfortable desk jobs, after passing out in flying colours from prestigious St Joseph college Darjeeling in 2010 but he chose to pursue his dream, he loved to be in field, among the guests, so it was only matter of time to enroll for guiding course. His first foray into job was in 2013 at Wind Horse Tours and still he is going great guns. Feed Backs from guests that he led are great testimonial to his dedication. He prodigiously read books that open up new frontiers and interaction with guests coupled with sound command of English takes his outlook towards learning and experiences altogether to different height. 4 " " All good. Yonten is a great guy and we enjoyed the time spent. the itinerary was kind of approximated but we managed to walk and see a lot. Great places. Thanks to all of you. All good. Yonten is a great guy and we enjoyed the time spent. the itinerary was kind of approximated but we managed to walk and see a lot. Great places. Thanks to all of you.